To open an occasional series looking at MLS ownership, Graham Parker sat down with MLS Commissioner Don Garber to talk about the phenomenon he believes is the most important development for the league in recent years: the change from a small number of owners, with multiple teams each, incubating the league, to a growing raft of entrepreneurs developing individual sides. In 2011, Los Angeles Galaxy won the MLS Cup at the Home Depot Center. The popular narrative of that moment was how David Beckham, totem of the designated player era, finally delivered an MLS Cup — and there’s certainly a lot to that. But when the trophy came out to be presented, MLS Commissioner Don Garber did not hand it immediately to Galaxy captain Landon Donovan, but instead made a short speech of thanks to L.A. owner Phil Anschutz, whose AEG also owned the majority stake in the team the Galaxy had just defeated, Houston Dynamo. Garber then presented the trophy, which bears Anschutz’s name, jointly to Donovan and Anschutz. On the face of it, it was one of those fairly standard ceremonial quirks that crop up in sports everywhere. If there was an odd note to it, it was the curiously valedictory feel of Garber’s speech — not that anyone gave it too much thought as the moment gave way to photographers grabbing the shot they really wanted: Beckham raising the trophy aloft. 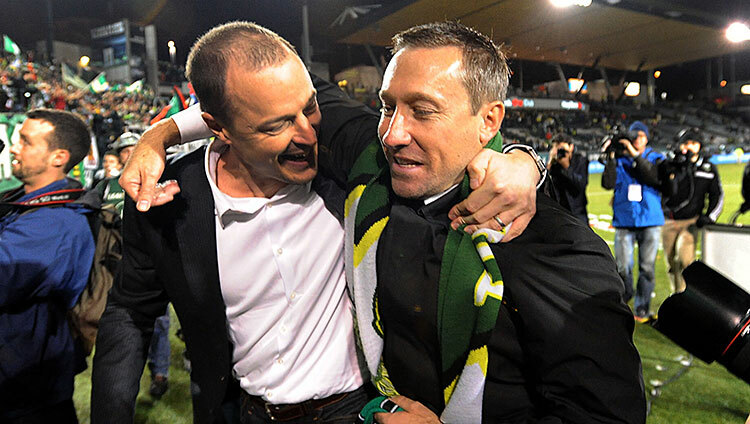 But this was an important moment in the recent history of MLS. We were indeed quietly marking the passing of an era that preceded Beckham’s arrival. At one point, post-contraction in 2002, AEG owned around half the teams in the league. When MLS kicked off this season, AEG was one of 18 owners of 19 teams (soon to be 21 teams with 20 owners) — a diversification of the league’s governance that has transformed the culture of MLS ownership from one of paternalist oversight to one where an increasing number of owner-operators personally direct and invest in their vision on a day-to-day basis. We then talked about the popular history of the league — a narrative that, in its crudest form, might run from its foundation, to aging stars, to contraction, to soccer-specific stadia, to designated players, and now, perhaps, to the return of the natives, with the recent Clint Dempsey–led influx of U.S. national team players returning from Europe. But possibly the most important of all those developments has been a slowly evolving ownership structure, and indeed slowly transforming fundamental philosophy, of Major League Soccer. While Garber has spoken bullishly in the past about the prospects of MLS, it has felt like a fairly recent phenomenon for its ongoing expansion to be matched by a similar expansiveness of tone from those who run it. Garber, as he has done at each public appearance in this offseason, emphasizes to me that the league is continuing to lose money, yet the comment sounds like an obligatory public tone-setter for the forthcoming collective bargaining year. Indeed, that trio — Kraft, Hunt, and Anschutz — ended up laying, then maintaining, more of a foundation than they’d expected. Nor could they have expected that the makeup and conversational tone of the MLS boardroom by the end of 2002 would be so sharply distinct from the same (rather more crowded) room just 12 years later. How that happened is a story that takes in broad capital investment from ownership groups around the country, but also one that takes in an unprecedented surge in digital culture that has shaped fans and owners alike. MLS is a league born and shaped in the Digital Age, and its present-day owners were, as Garber tells me, “born out of that movement.” Still, in 2002 it looked like there was a long way back. In Part 2 of this story: how Garber and a handful of owners navigated the long road back from contraction, and how the new breed of owners are transforming MLS and setting expectations for a crucial year. Is Virginia the Least-Respected Great Team in College Hoops History?